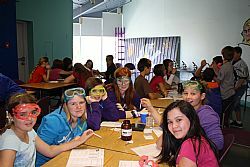 SARASOTA – GWIZ Science Museum recently provided three Water Wonder Workshops to 150 local students in fifth and sixth grade from Lamarque Elementary, Heron Creek Middle School and Englewood Elementary. The program included classroom instruction about the physical and chemical properties of water and guided bay walks to learn more about local plants, wildlife and the impact of human development on local ecosystems. The final component of the workshops was comprehensive water testing and microscope observation. SBEP provided funding support for the GWIZ workshops through its Bay Partners Grant Program. The purpose of the SBEP grant program is to promote environmental education, awareness and stewardship that benefit Sarasota Bay and its tributaries. Funding is available for local projects that focus on Bay education, Bay restoration or Bay-friendly landscaping. SBEP has awarded more than $213,000 in support of 109 local grants since 2003. All of the grants require an education component that encourages Bay-friendly stewardship. Businesses, non-profit organizations, schools, condo associations, and neighborhood associations located within the Sarasota Bay watershed in Sarasota and Manatee counties are eligible to apply for a grant each year. Organizations are considered for full or partial grants by a subcommittee with the SBEP Citizens Advisory Committee (CAC). Bay Partners Grant applications for the next fiscal year must be received at the SBEP offices by 4pm on Friday, March 1, 2013 to be eligible. Applications can be downloaded from the SBEP website at sarasotabay.org. The SBEP website also provides specific ideas for various projects. Inquires are welcome at sara@sarasotabay.org.